POLITICS IS DOOMED to a fate of self-transformation and displacement. The displacement of politics does not necessarily imply the disappearance, retreat or lack of politics but rather refers to the constant alteration of the conditions upon which its rests. Rather than justification and judgment, politics parallels experimentation and discovery. Politics is that which has just happened or that which is on the brink of happening. One has to produce new perspectives and new concepts in order to perceive politics as innovative and novel. 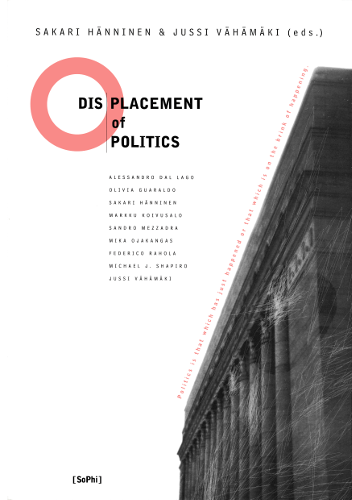 IN THIS COLLECTION of essays political experiences are diagnosed and analyzed by reading quite different textual sources: films, the experimental writings of William Burroughs, the ethnographic meditations of Marcel Mauss, narratives, genealogical histories, political theory and political commentaries. ONE WAY OR ANOTHER, these readings address both the question of the possibility of politics and the question of control within our actuality. If globalization corresponds to the displacement of politics, displaced persons appear to be new political subjects, non-persons, whose political experiences are situated within this interface. These readings challenge what we mean by politics.